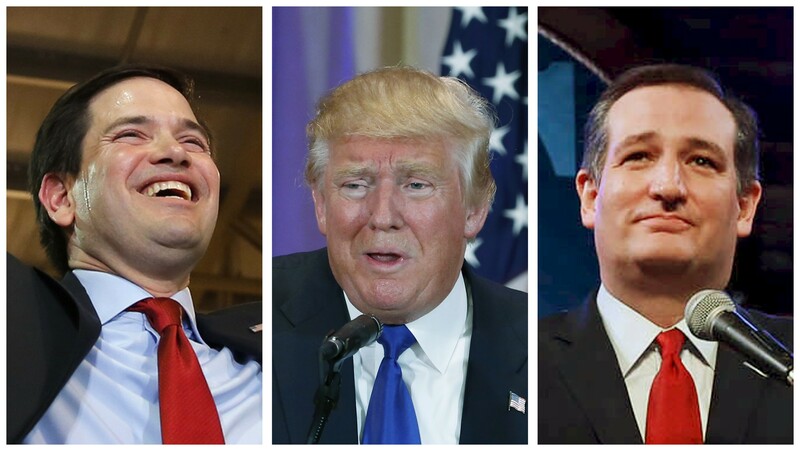 Who supported Donald Trump, Ted Cruz and Marco Rubio? Republican voters in the nine primary states voting Super Tuesday were unhappy with the way the federal government is working, and very worried about the direction of the nation's economy according to voters who were interviewed in the CBS News exit polls. More than half said they felt betrayed by Republican politicians and would like the next president to be from outside the political establishment. Large majorities support a temporary ban on non-citizen Muslims entering the U.S. However, there is disagreement about the best way to deal with illegal immigrants with roughly equal numbers wanting them deported or offered a path to legal status. Voters were also split on the most important issue facing the country, with large numbers saying the economy and jobs, terrorism, and government spending. Donald Trump continues to draw substantial support from the most disaffected Republican voters and those who want to close the U.S. borders. Between 60 and 80 percent of Republican voters support a call for a temporary ban on non-citizen Muslim entry into the U.S. and Trump won 40 to 55 percent of their support across the primary states. Somewhat fewer voters want to deport all of the illegal immigrants working in the U.S. On average, Trump gained almost half of these voters. Trump also showed strength among Republican primary voters who said they were very worried about the direction of the U.S. economy, angry at the way the federal government is working, and who felt betrayed by Republican politicians. Given these strong feelings about the failure of the political establishment it's not surprising that about half of Republican voters wanted the next president to be from outside of politics. And this is where Trump's support comes together. Across the primary states today, Trump captured half to three-quarters of those voters. The other consistent predictor of support for Trump in Tuesday's primaries was education. Continuing a trend seen in the previous Republican contests this year, Trump does especially well among those without a college degree. He draws substantially less support among college educated voters and, especially, those with post-graduate degrees. Ted Cruz won his home state of Texas, its neighboring state of Oklahoma and in Alaska. He also ran strongly in Arkansas. In Texas, Oklahoma and Arkansas, Cruz ran strongly among those who form his base in the Republican Party -- those who consider themselves strong conservatives and evangelical Christians. Cruz won half of all strong conservatives in Texas and over 40 percent of those voters in Oklahoma and Arkansas. Cruz won almost half of white evangelicals in Texas and ran strongly among this group in Oklahoma and Arkansas. In other parts of the country, however, Cruz has not been able to attract enough votes from these very same groups. For example, he lost to Donald Trump in Alabama, Massachusetts, Tennessee, and Virginia among both strong conservatives and white evangelicals. This failure to appeal broadly to his core constituencies nationally helps to explain his relative poor showing in many of the states voting today. It is particularly telling that he could not win over these groups in Alabama and Tennessee that were supposed to be among the states that would help him win the Super Tuesday primaries. Not all Republican voters want an outsider to be the next president. Some want an experienced politician. Marco Rubio is relatively popular among these voters. He won 49 percent of this group in Virginia, 46 percent in Alabama, and 43 percent in Georgia. Voters looking for a candidate to win in November supported Rubio. In each race where the voters were asked, except Massachusetts, Rubio was the choice for voters who most valued a candidate winning the general election. Many late deciders among the Super Tuesday voters supported Rubio. This ranges from about a quarter of the people who made the decision on whom to vote for in the past few days in Texas, Alabama, Massachusetts, Tennessee, Vermont, and Georgia, to 38 percent of late deciders in Oklahoma, Virginia, and 40 percent in Arkansas. About half of primary voters asked said that they thought that most illegal immigrants working in the U.S. should be offered a chance to apply for legal status. Among voters in this group, between 30 and 40 percent supported Rubio. The problem for Rubio is that his areas of strength are not large enough segments of the Republican primary electorate. Only about 15 percent of voters chose winning in November as the quality they most valued in a candidate. A majority of voters wanted someone from outside the political establishment, not someone with experience. And a large majority of Republican voters had already made up their minds before the last week of campaigning. These limitations in the ability of both Cruz and Rubio to expand their bases of support to large enough groups of Republican voters is enabling Donald Trump to continue to win many of the Republican primaries and to accumulate the number of delegates that he needs to win the Republican presidential nomination. In six of the CBS News exit polls conducted today (Alabama, Arkansas, Georgia, Tennessee, Texas, Virginia) voters were asked how satisfied they would be if Trump, Cruz, or Rubio won the Republican nomination. In all of these states about three out of four Cruz and Rubio voters said they would be dissatisfied if Trump is the nominee. About six in 10 Trump voters said they would be dissatisfied if either Cruz or Rubio is the nominee. What was on voters' minds on Super Tuesday? There has been much talk about what would happen if or when another candidate was to drop out of the election. Where would their support go? Among Cruz voters, the majority across all of these states would be satisfied with Rubio if he won the nomination, ranging from 55 percent in Alabama to 67 percent in Virginia, including 67 percent of Texas voters. Conversely, Rubio voters would not be as happy with Cruz as the Republican nomination. The support ranges from 39 percent in Alabama to 51 percent in Tennessee. Cruz and Rubio voters would be unhappy with Trump as the Republican candidate in November. A majority of Trump voters would be unhappy with any other candidate getting the nomination. This is a problem the Republican party may have to grapple with as it gets closer to the general election.